Award winning screenwriter Aaron Sorkin has been tapped to script the film adaptation of Steve Jobs. Sony Pictutres announced this evening that is has entered into an agreement with Aaron Sorkin to script the film version of Walter Isaacson's biography of Steve Jobs from last year. This is not to be confused with the Ashton Kutcher film that is currently in production, but instead is probably the closest thing we will ever get to an official film based on the Apple co-founder's life. Sorkin is best known as the creator of The West Wing, but he was also the screenwriter behind the highly successful film The Social Network that told the story of the early days of Facebook. No release date for this film has been announced as of yet. Published late last year, Steve Jobs was Amazon's best-selling book of 2011. In addition, the biography ranked #1 among bestselling hardcover books by a 2:1 margin, with sales of 2,246,569 in 2011, according to Publisher's Weekly. Commenting on the announcement, Pascal said, "Steve Jobs' story is unique: he was one of the most revolutionary and influential men not just of our time but of all time. There is no writer working in Hollywood today who is more capable of capturing such an extraordinary life for the screen than Aaron Sorkin; in his hands, we're confident that the film will be everything that Jobs himself was: captivating, entertaining, and polarizing." AARON SORKIN won the Academy Award® for Best Adapted Screenplay for his work on The Social Network. His other screenplays includeMoneyball, Charlie Wilson's War, The American President, Malice, and A Few Good Men. He has also acquired the motion picture rights to The Politician, the best-selling book by Andrew Young about the downfall of former Senator John Edwards. He will adapt the book and make his directorial debut with the film, which he will also produce. For television, Sorkin created "The West Wing," "Sports Night," and "Studio 60 on the Sunset Strip." He is currently in production on the HBO series "The Newsroom," which is scheduled to premiere on June 24, 2012. 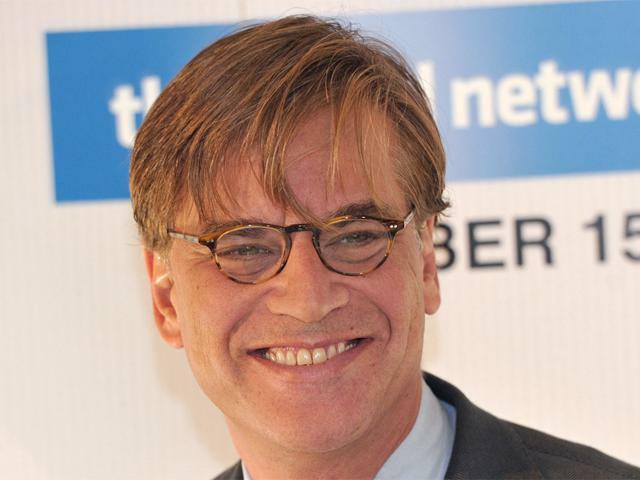 For the stage, Sorkin wrote "A Few Good Men" and "Making Movies"; he returned to Broadway in 2007 with "The Farnsworth Invention." Sorkin will return to the theater and make his Broadway debut as a librettist with the 2013-2014 production of "Houdini." Based on the life of legendary magician Harry Houdini, the musical will star Hugh Jackman and will feature music and lyrics by Oscar and Grammy winner Stephen Schwartz.